A sixth-plate tintype from the Donald Bates Sr. collection pictures two Union soldiers, one with a banjo and the other with a fiddle. 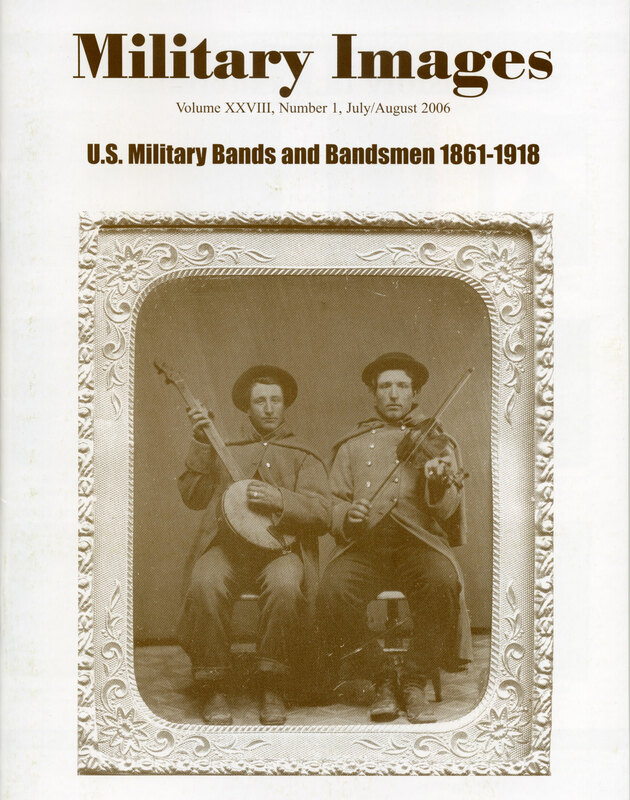 The editor welcomes readers to this special issue dedicated to U.S. military bands and bandsman, 1861-1918. Also mentioned is the passing of Dr. Francis Lord, 94, who authored pioneer books about Civil War relics, including his landmark 1963 reference volume the Civil War Collector’s Encyclopedia. Mail Call features a single letter about experiences in Multigraph photography. One book is recommended: The Shenandoah Valley Campaign of 1864 (University of North Carolina Press) by Gary W. Gallagher. The introduction to this multipage cover story examines the integral role played by musicians in every U.S. war since the Revolution. The author notes, “Fortunately for students of U.S. military history, the documentation, and surviving examples of instruments, uniforms, and sheet music, allows us to virtually recreate the entire experience. The increasingly successful efforts of Civil War re-enactors to replicate accurate band and field music are now a staple of most events. This article is a quick look at the original bands and bandsmen from 1861 through WWI.” The photo survey that follows is divided into sub-sections that include profiles. A total of 31 images of all formats includes the following identified individuals: Connecticut drum maker C.B. Hendrick, the Rebagg Brothers of Rochester, N.Y., Christian Heckler of the 62nd Illinois Infantry, the Smith brothers of Illinois regiments (John of the 89th, Joseph of the 36th and William of the 26th), John Miller of the 100th Indiana Infantry, Robert Henry Hendershot of the 8th Michigan Infantry, Archibald Godley of the 14th New York Heavy Artillery, John S. Kountz of the 37th Ohio Infantry and John G. Webb of the 78th Pennsylvania Infantry. A total of 18 images of all formats includes the following identified individuals: James Porter of Gen. Grenville Dodge’s band, George Lowman of the 36th Illinois Infantry, Jeremiah Potter of the 2nd Rhode Island Infantry, Robert J. Hancock and David L. Thomas of the 3rd Rhode Island Cavalry and Edwin Ordway of the 1st Vermont Heavy Artillery. A sketch of the life and military service of the song O’Canada is illustrated with a quarter-plate ambrotype of Lavallee and his brother George during their service with the 4th Rhode Island Infantry. A total of 24 images of all formats includes the following identified individuals: John H. Buckner of an unidentified post-war regiment, Joseph Gibble of the 12th Ohio Cavalry and Emil Smith of the 39th Ohio Infantry. A total of 6 images includes the following identified organizations: the U.S. Military Academy Band in 1864, the band of the 12th U.S. Infantry at Chickamauga, Ga., in 1898 and Watson’s Band, 1st Minnesota Infantry, Minnesota national Guard, in 1898. Three images of the band of the 370th U.S. Infantry, an African American World War I unit, which served alongside the famous 369th U.S. Infantry (Harlem Hell Fighters) in the French army. An image of the band of the 1st California photographed in the Philippines in 1899 pictures von Staden holding his baton. A sketch of the regiment and his service is included. 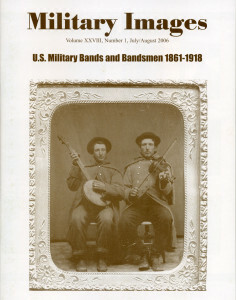 In “The Military Band,” McAfee provides a short history of Union Civil War bands. A dozen cartes de visite illustrate the text, including Charles Grimmer of the 17th U.S. Infantry. A total of 11 portraits of bandsmen include 1st lt. George Andrews of the 25th U.S. Infantry astride his horse “Bob,” Dunallen M. Woodburn of the 58th Ohio Infantry and the band of the 329th U.S Infantry of the 83rd Infantry Division. “Band Gone Wild” is the headline that accompanies this image of the band of the 1st Minnesota Infantry, Minnesota National Guard. The members are attired in a bizarre assortment of costumes for a mock parade.